It is simply NOT fair to ask someone to do the job of Provost this long – he’s already completed one year and would complete at a minimum about 2 1/2 if I started a national search now – with an “interim” title. I’m not defending Jerry against anything, I’m just making it clear that I am the one (not him) that asked him to consider staying (assuming a positive review). I’m not defending him, I’m assuming accountability for this. As I said when I was “interim” all positions are interim, no one is ever permanent. But interims have no contracts and can be terminated at any time. I do not think it’s fair for me to be asking him to assume the FULL role of Provost, which he is doing in a position where he could be terminated at any time, rather than with a 2 year contract. Among these duties are Dean reviews which no other interim has done, resulting in deans serving in their roles for 6 or 7 or even 8 years without review — what happens when you have a string of interims. Interims don’t perform these duties because it makes no sense for them to appoint or re-appoint a Dean, or Vice-Provost, when there might be someone new coming into the role any minute. It’s the same reason I did not conduct a search for a Provost when I was Interim President. 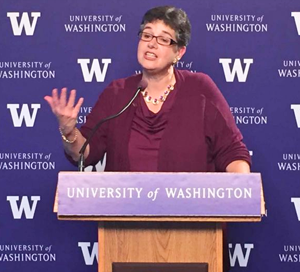 One of the things we’ve developed at the UW – I’ve said this on the record before – is a culture of “I can wait then out” with regard to the President and Provost. This has led not only to postponement of reviews but, in some cases, less accountability from leaders than desirable. Quite honestly, I think this has become a problem throughout academia, not just with us. I find it ironic that you suggest that the issue isn’t with the length of service, or even with the duties, but, it appears it’s simply about dropping 7 letters from the title. In my humble opinion, keeping Jerry on in an interim role for 2 more years, performing all the duties of the Provost, without having him vetted by a committee and seeking input from faculty and students, and their leadership, would truly be an act lacking in integrity and transparency. I didn’t do it, because I thought it was wrong, and I still think it is wrong. I would have been more than happy to have this discussion in detail with AAUP leadership if I’d been asked. Unlike previous leaders which have ignored AAUP, I’ve always treated this group with respect. So, I’m really disappointed that the AAUP leadership (the President and at least one member of the executive board) who were at the Senate Executive Committee when I first floated this idea in the Fall, didn’t express their disagreement with it then, either to me or to Senste leadership. There is NO question that when we are looking for a Provost to fulfill a 5 year term we WILL have a national search and several candidates will come to campus. But, I won’t, without consultation and input, ask Jerry to, de facto, serve as Provost for 2 years, performing the full set of duties, and just make pretend it’s something different because there’s an “interim” in his title. THAT would be dishonest. I am simply not willing to give up my integrity to make everone happy or to comply with the letter of a resolution, instead of complying with the spirit of it. If enough people think Jerry is the wrong person to serve in this capacity another 2 years, there is plenty of opportunity for input. I urge you all to attend or stream his talk and offer input. But, If the problem isn’t about the candidate (since you suggest you’d be fine with him continuing), then your problem is with me and the integrity of my leadership. There are avenues you can use to express that. The Regents will be reviewing me in June.